A few weeks ago our family moved into a new house! It was a short move (just up the street from our old house) so we are still in Orange County, California and still in the same school district for our kids. But we feel so blessed to have found a home that fits our family better as the kids grow bigger and my crochet business continues to flourish! Plus we now have enough space for the grandparents to come stay with us for as long as they’d like! I am so excited to finally have my own studio! A space dedicated to my yarn and crochet that doesn’t have to be shared with anything else. A space where I can close a door and work on video and photo tutorials. A space with an abundance of natural light. And a space where I can welcome friends in to craft and crochet with me! My yarn room is at the front of our house with a beautiful bay window (*pinch me* this is a dream come true!) and has just enough room for a craft table and a set of bookcases to hold my yarn stash! When I pull into the driveway you can see the wall of rainbow color-coordinated yarn gleaming at you. It’s so inspiring and inviting! This picture was taken at night looking into the bay window from the driveway. It all started with THESE Ikea Billy Bookcases! Ready to be filled with yarn! I love seeing my yarn organized by color and since most of my collection is currently worsted weight yarn, it made the most sense to sort by color instead of brand or weight. My craft table is also from Ikea (the NORDEN table). It is the perfect surface for photos and video and such a great spot to craft, crochet, or just type up a blog post! It has 3 storage drawers on either side that are a great size for hooks and crochet accessories! Each side folds down which makes it great for moving around or out of the way. 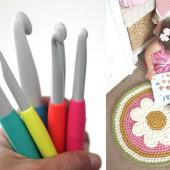 See that lovely “Heart to Crochet” sign?! That is string art from The Honaker Homemaker! 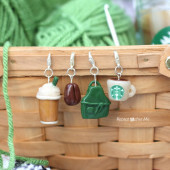 Check out her amazing talent HERE on etsy. I have a few wire metal storage cubes (purchased HERE) that hold several of my crochet blankets and a shelf I picked up from HomeGoods where I can keep my business papers, crochet magazines, and more. OH! And another Ikea MUST HAVE is the RASKOG Cart! I am currently storing my works-in-progress and soon-to-be used yarn 🙂 But there were days when it was even more functional. You can see my RASKOG post HERE. Also, the female dress form is from Amazon (HERE) and I use it to display my latest shawls or wraps! 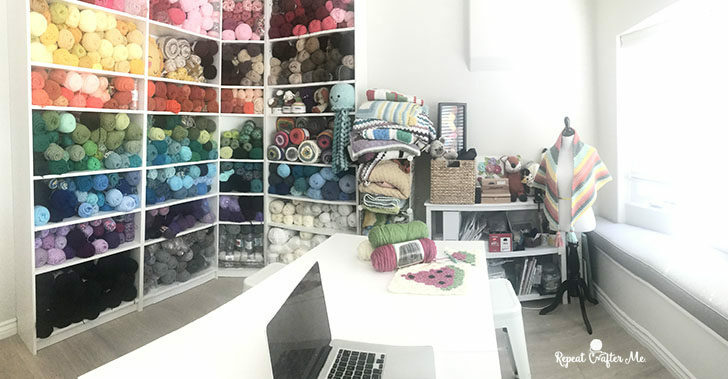 I still have a lot more organizing to do but I couldn’t wait any longer to show you guys my new yarn room! I hope you have enjoyed seeing it and feel inspired! I will continue to post pictures as I get it more in order! Yes! Another papercrafter! That is my number 1 favorite thing to do and it always makes my day when I find someone else with the same passion. Gorgeous, Sarah! Congratulations on your new home! Wow, that wall of bookshelves is just beautiful! I’m sure it’s very inspiring to just sit and look at it. Enjoy your new home! That’s a great room. I love the shawl on the form! Is that a pattern you’ve released? I also have a room full of Billy bookcases in my basement. But they’re actually filled with books! I also recently made a craft room in my basement. Lots of ikea furniture in there too. I don’t have a big yarn stash like you so I mostly throw my yarn into plastic bins. It’s great to have dedicated rooms if you have the space 🙂 🙂 enjoy your new room! oh my God! what a wonderful room! may I ask why you doesn’t have a cozy chair/armchair/sofa for crocheting? So happy for you .what a wonderful craft room . Truly inspirational surrounded by such gorgeous colours. Can’t wait for your next video creation to come from here. This is like a dream come true, so lovely. Lovely to be over there when you crochet and just enjoy the space. Oh how I’m envious (in a good way), this is my dream too. I would love to have such a space for my yarns!! 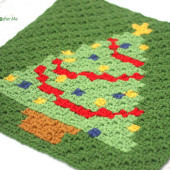 This is one of the most beautiful websites I found for crafts. There are many interesting activities, and are awesome. For quality essays, you can hire professional writers at academic paper writing service. It’s worth the money when you get the quality. 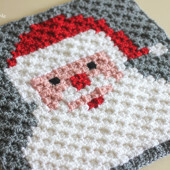 This is one of the most beautiful websites I found for crafts. Very nice, seeing how well organized you have made your new room in your new home Congratulations! ¡Qué envidia me das! Con un solo armario para mis manualidades me conformaba, pero estoy entre pequeños huecos y el trastero danzando todo el día. I love all your projects, and I am very happy for you and your new room!!! I have learned so many things from you. I hope that you continue to teach people how to make cute projects for a long time. Very nice! We live in Northeastern California, in the woods, in manufactured home. I took one of the spare bedrooms and made it my “studio”. I rarely write my patterns down, but I do use this room to keep my clutter out of the rest of the house. I bought some cube cases and baskets to store my yarn, but I am still overflowing. LOL It was very pretty when I first put it together, not so organized now. Here’s hoping you are more organized than this old gal. You did a great job designing your room. Enjoy it for a long time. Wow, what a lovely studio! I’m so happy for you, Sarah! Have fun! I have read through other blogs, but they are cumbersome and confusing. I hope you continue to have such quality articles to share! Good luck! I may be only turning eleven next week, but I have a knack for crocheting hats especially, and I really do love your jellyfish plushie pattern!!! Must say I’m a little jealous lol. Love your home and a room all to yourself mine I share when my daughter and partner visit. Would love to set up a business like yours was it difficult?. I’m a novice with a lot of enthusiasm. It is amazing and as it is beautiful. I told my husband honey can you make one of these rooms lol. He smiled. One day One day.